Welcome to the first update of the GameGuru Antiques in the Attic Pack! We couldn't possibly top the quantity and quality of the assets available in this great pack so we've upped the functionality instead. In this update, you'll find the "Cabinet 2b" entity has now been improved with a custom script which allows the draws and doors that come with it to function as you would expect them to. Providing you don't change the name of the entities and drag in the additional entities for the doors and draws (namely Cabinet Door 2a, Cabinet Door 2b, Cabinet Drawer 2a, Cabinet Drawer 2b), now when you drop them in and place them correctly on the Cabinet 2b entity, you can run up to it in the game and press E to conduct a search of the cabinet. 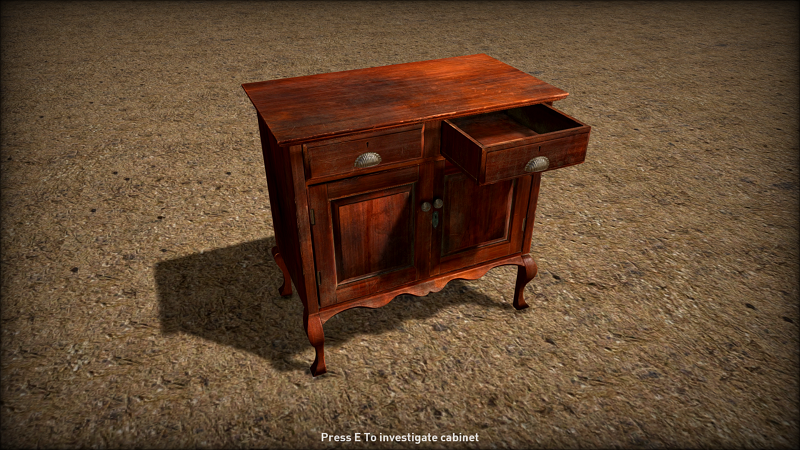 The new scripts are called "cabinet.lua" and "cabinetpart.lua", located in a new "antiques" scriptbank folder, which are easy scripts to follow. You can modify these to take the logic a stage further, perhaps to give the player a reward when they find something in one of the draws, or reveal an entity previously hidden when exposed.